Lamont-Doherty's Secondary School Field Research Program (SSFRP) brings high school students, science teachers and undergrads to the Lamont campus each summer for six weeks of field and laboratory research. Once on campus, the students and teachers are treated as early-career scientists, with our researchers as their mentors. 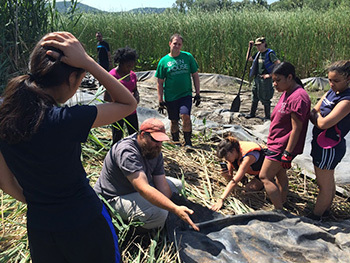 The students use Piermont Marsh, a research reserve in Piermont, New York, as their field site and outdoor classroom. Working in teams, they conduct rigorous research into different aspects of the ecology and physical conditions of the wetland. Students collect samples and do laboratory experiments on everything from nutrient cycling to natural carbon sequestration to non-chemical management of invasive plants to the construction of rechargeable batteries powered by soil bacteria. In addition to their hands-on work, the students and teachers read and discuss scientific literature, receive one-on-one mentoring from Lamont researchers, and take classes in data analysis and field science. Each team creates a research poster and a PowerPoint presentation at the end of the summer. After the completion of the summer program, the SSFRP works year-round with students and teachers at schools on after-school science projects and science fair submissions. Our high school students and teachers have presented abstracts at the Geological Society of America, the American Geophysical Union, the Society of Wetlands Scientists, and the Passaic River Symposium, as well in their local communities and schools. The program began in 2005 as an ad hoc partnership between Lamont scientist Bob Newton and New York City science teacher Susan Vincent working with 10 students on an educational outreach component of a National Science Foundation Arctic Natural Sciences grant. Its scientific scope has expended each year since. In the summer of 2016, we had 46 high school students, 12 college students and eight high school science teachers working on research teams guided by Lamont scientists and mentored by Columbia grad students and post-docs. Currently, our partnering schools are The Young Women's Leadership School of East Harlem, The Young Women's Leadership School of Queens, and The Urban Assembly New York Harbor School. In the past, we have worked with Frederick Douglass High School I, Curtis High School, and the Manhattan Hunter Science High School. Each year, we also welcome students from Bergen Academies, Suffern High School, and Tappan Zee High School. We currently receive major support from the Pinkerton Foundation, and we are working with the Charles Hayden Foundation to make the program available to some of the schools Hayden supports. The program also receives funding from The Young Women's Leadership Network. In the past we have received funding from the Toyota Tapestry Foundation and the Society for Science and the Public (connected to the Intel Corporation). We also have received significant funding from the National Science Foundation. Students learn to use meter to collect water quality data. 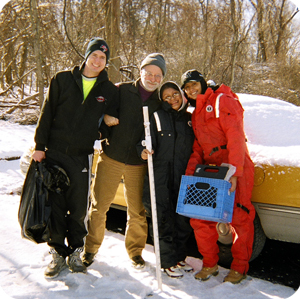 Dr. Newton with the hardy few - winter sampling in marsh.